Recent figures published by the Apartment Association of Metro Denver (AAMD) and James Real Estate Services (JRES) point to rising vacancy rates in 2014 and beyond. Rampant construction will be the cause, and it will be the new buildings that face the most pressure. The impact on existing apartment buildings in Denver, Colorado will not be immediate, but in past market cycles rising vacancy proved inevitable for everyone. 17,759 units are currently under construction in metro Denver, with nearly 9,300 of those in the 46 projects currently underway within the City and County of Denver. Lined up behind the existing construction projects, JRES published a list of over 16,000 additional units currently in the permit/planning stage for 78 projects across the metro area. Unfortunately, we already saw vacancy rates rise from 4.9% to 5.2% in 2013, a year when less than 4,000 units were built. 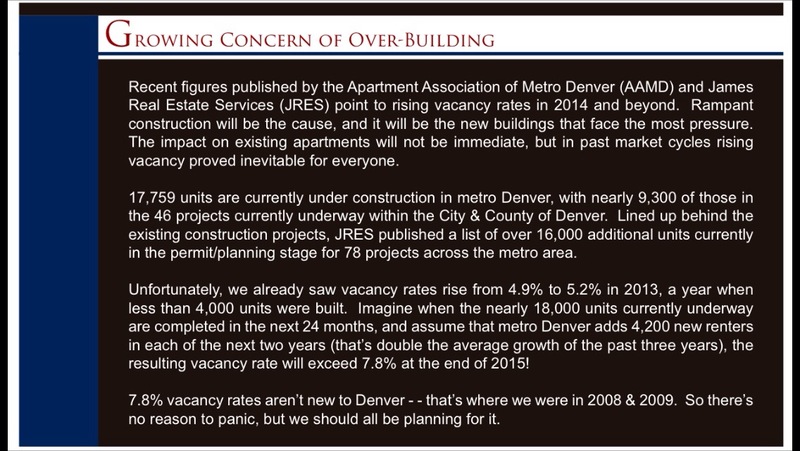 Imagine when the nearly 18,000 units currently underway are completed in the next 24 months, and assume that metro Denver adds 4,200 new renters in each of the next two years (that’s double the average growth of the past three years), the resulting vacancy rate will exceed 7.8% at the end of 2015!